Early next year (January 29, 2013) Martha will release her first book on caregiving: Living The Good Long Life: A Practical Guide To Caring For Yourself And Others. The 432-page hardcover book will be the first book by Martha that focuses, specifically, on healthy living and caregiving. Several years ago Martha mentioned that she was working on this book. It was a project inspired by her mother's longevity and active lifestyle, as well as the difficulties surrounding her eventual decline at the age of 93. Martha was surprised to learn that there was no practical book out there to help people deal with the logistics and very real challenges that come with caring for aging relatives and vowed to write that book herself. 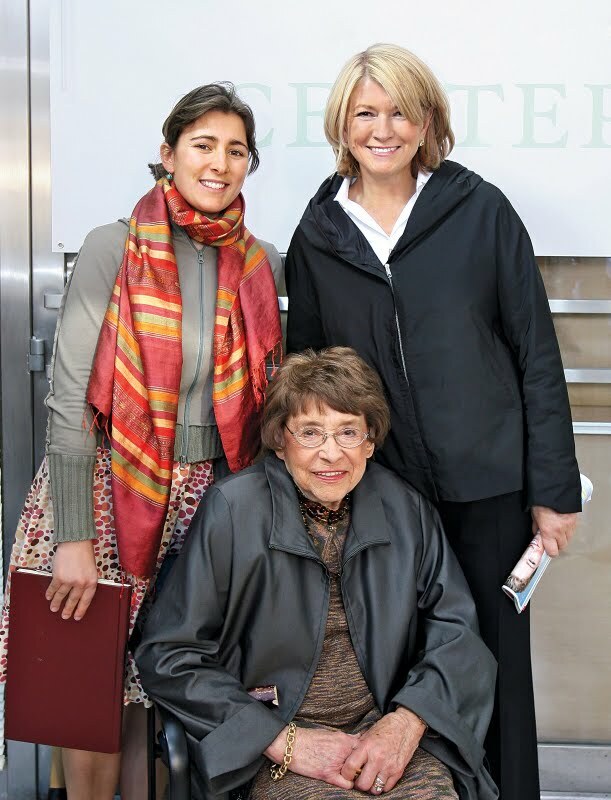 Martha with her mother, Martha Kostyra, and Martha's neice, Sophie Herbert, at the Martha Stewart Center For Living at Mount Sinai Hospital in New York City. Martha wrote a wonderful column for the Huffington Post a couple years ago examining the looming spectre of an aging American population and its likely strain on the healthcare system. Martha is also the founder of a unique geriatric center at Mount Sinai in Manhattan (The Martha Stewart Center for Living) which is devoted to facilitating access to healthcare resources for the elderly and to raise awareness about healthy aging. At the moment there is no official description of the book, but its title speaks volumes about its aim. I imagine it will be similar in style to the Homekeeping Handbook with concrete solutions to everyday questions and challenges regarding healthy living and caregiving: the best methods for keeping track of an elderly parent's prescriptions, for example, the best power foods, the importance of exercise and continued learning, etc. Having so many aging relatives in my own family - with parents swiftly making the climb into old-age - it is a book I am eagerly anticipating. I am sure this book will be an interesting and amzing one.